The aptly named Grazing restaurant in Gundaroo, 25mins northeast of Canberra. A burgeoning collective of gourmet experiences, quality restaurants, budding wineries, art and craft stores and boutique lodgings, The Poacher’s Way is drawing visitors to the Canberra and surrounds like never before. Local lad Mark Juddery loses his way among just some of its many, many attractions. Listing the many attractions of The Poacher’s Way is like leafing through a small-business guide from the ideal “charming country town”: galleries, craft shops, cafés, restaurants, quaint B&Bs, perhaps a few wineries. The difference is that these businesses are spread out over a wide area, from Bowning to the northwest of Canberra, all the way to Bungendore on the eastern fringe of the national capital. This collective, formed to highlight Canberra region, is a series of places with seemingly little in common aside from small-town charm. 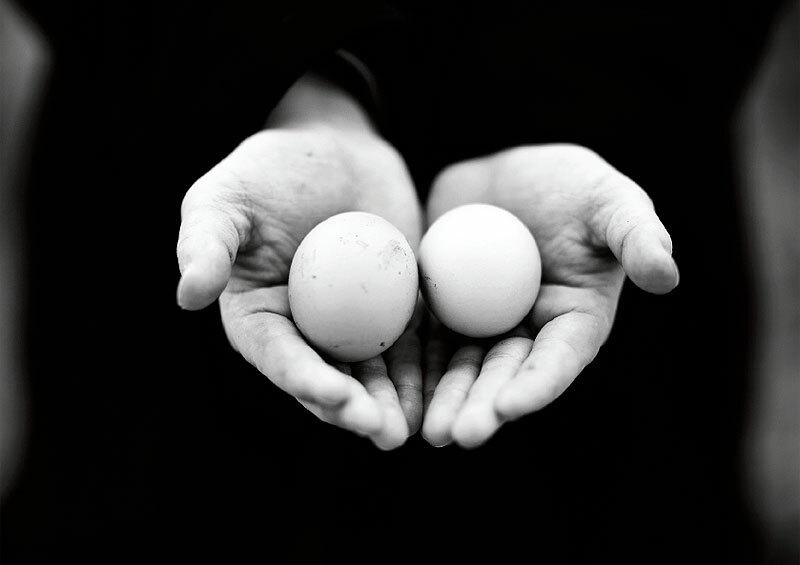 Since its founding in 2005, many businesses have applied to join The Poacher’s Way. Not all have been accepted. “You know one when you see it,” says Sue Bruce, who sits on The Poacher’s Way committee and is the owner of one of its original members, Poachers’ Pantry. The Poacher’s Way has promoted the collective well, attracting tourists from around the world, even posting suggested two- and three-day itineraries on its website, www.thepoachersway.com.au. Next time you’re in the national capital, it’s worth spending a weekend (many of these places are closed for most of the week), exploring the area. Several Poacher’s Way businesses are based in Canberra itself, albeit nestled safely in the suburbs. Pialligo Village, near the airport, is an incongruous rural scene of fruit sellers and artisans. 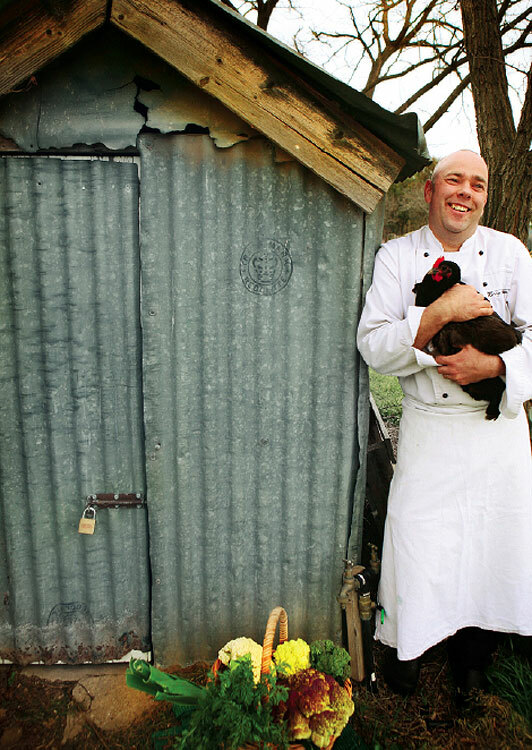 In this area, Podfood café and restaurant, the brainchild of chef Andrew Haskins (formerly of Canberra’s late, lamented The Fig restaurant) is as notable for its location – a 1930s cottage surrounded by the gardens of Pialligo Plant Farm – as for its fine food. Pialligo Estate winery (with cellar door and café/restaurant) also makes its home here, and is quite possibly the only vineyard in the world with views of its national seat of parliament. The restored farmhouse now provides hot-smoked meat to Tetsuya’s and the business class menus of Qantas. The Silo Bakery & Cheese Room is in Kingston, one of Canberra’s oldest suburbs, where – apart from the crowds – the 1920s-style shopping area (the one-time town centre) still has the feel of Canberra when it was a small town. The Silo, even after more than a decade, can still claim to be one of Canberra’s trendiest cafés and bakeries, but its true allure can be seen in its extensive selections of wine and cheese. The suburb of Deakin, meanwhile, is the home of Beaver Galleries, Canberra’s largest privately owned gallery, showcasing the work (paintings, sculpture gardens, glass and ceramics) from a generous number of mostly local artists. Pialligo Estate (02) 6247 6060. Silo Bakery & Cheese Room < (02) 6260 6060. Beaver Galleries (02) 6282 5294. 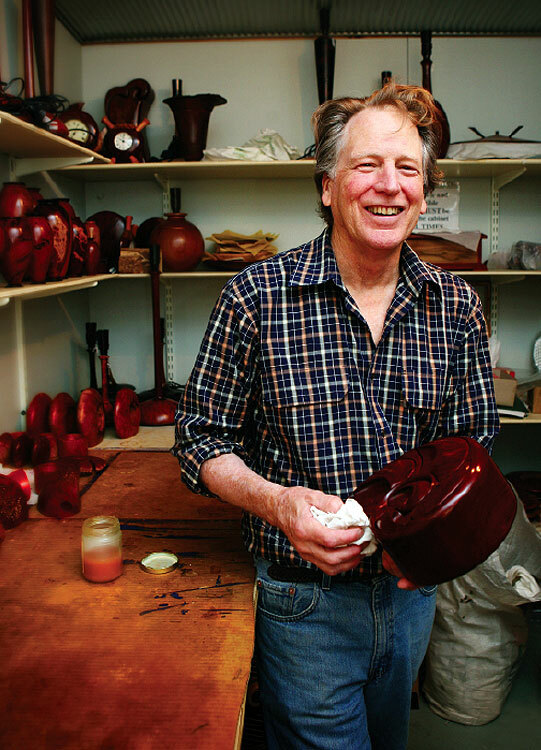 For lovers of handicrafts, The Poacher’s Way has plenty to reveal. In Bungendore, 40mins due east of Canberra, the largest and most familiar building is the Bungendore Wood Works Gallery, which acts as both a gallery and a retail centre for many of Australia’s top woodworkers. 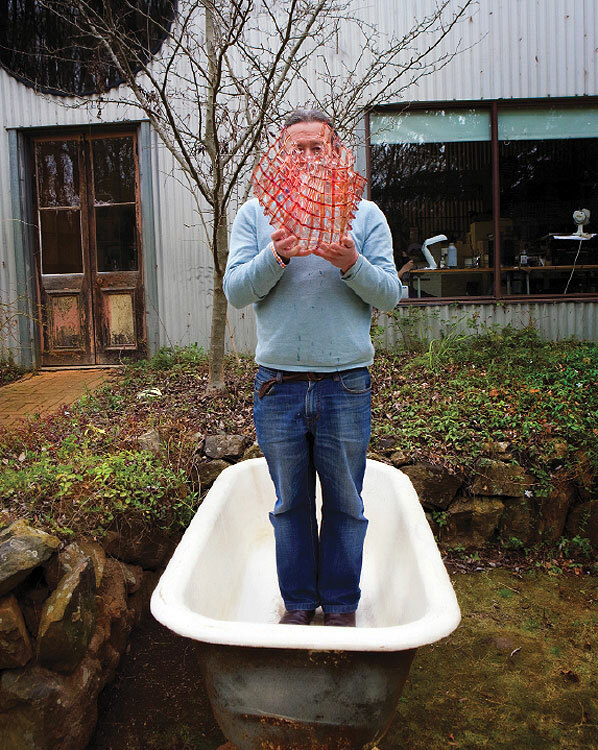 Off the road to Gundaroo is the far quieter and more secluded gallery of Old St Lukes Studio, a church and school in the 19th Century that now houses the work (and workshops) of acclaimed potter Ian Jones and his partner, Moraig McKenna. 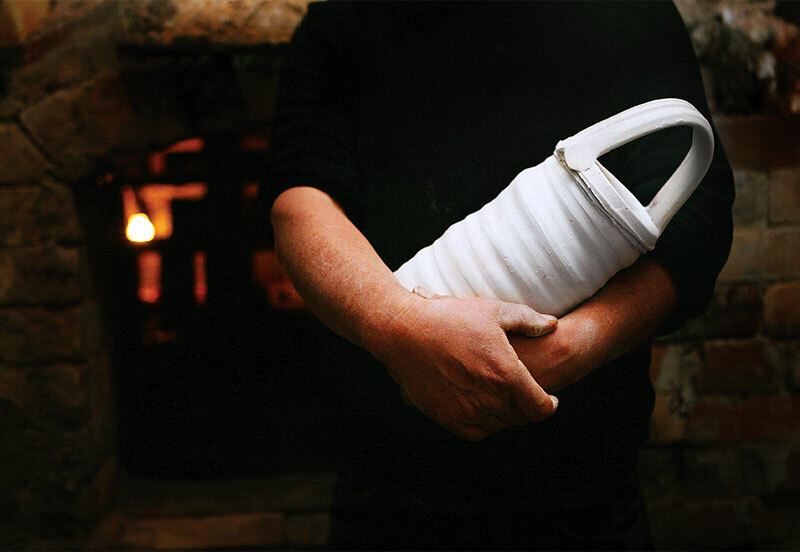 Their pottery, all produced onsite in a giant kiln, is difficult for most visitors to tell apart – but Jones notes that McKenna’s work is “cleaner and more subtle”, while his own is shamelessly “in your face”. Northwest, not far from Bowning, the Crisp Galleries showcase the astounding glasswork of Peter Crisp, using the ancient Egyptian style of “slumped glass”. Crisp’s work has been sold at Harrods in London and commissioned for Prince Charles. It’s perhaps fitting that the gallery includes a performance space, in which audiences of up to 200 can enjoy regular classical concerts. The Strauss Ball, executed by a 40-piece orchestra, is held here twice a year. Bungendore Wood Works Gallery (02) 6238 1682. Old St Lukes Studio (02) 6236 8197. Crisp Galleries (02) 6227 6073. In the fast-growing town of Gundaroo, 25mins northeast of Canberra, a restaurant with the unusual (but fitting) name of Grazing specialises in organic ingredients – even the flour. Owner and head chef Tom Moore eagerly showed me the garden, inviting me to sample whatever took my interest. The fact that the food is homegrown is impressive, but even more intriguing is a glance at what they grow: not only the obvious fare (pumpkin, asparagus and the like), but thriving beds of quince, cavolo nero, lemon balm, even stinging nettle. The less-common ingredients reflect the innovative menu – wonderful renditions of pithivier (vegetable pie) or charcuterie – and the service is impeccable. Alternatively, a visit to Gundaroo would require a trip to the old police stables, converted into the Cork Street Gallery Café, where the 30 flavours of gourmet pizza might impress the kids more than charcuterie. 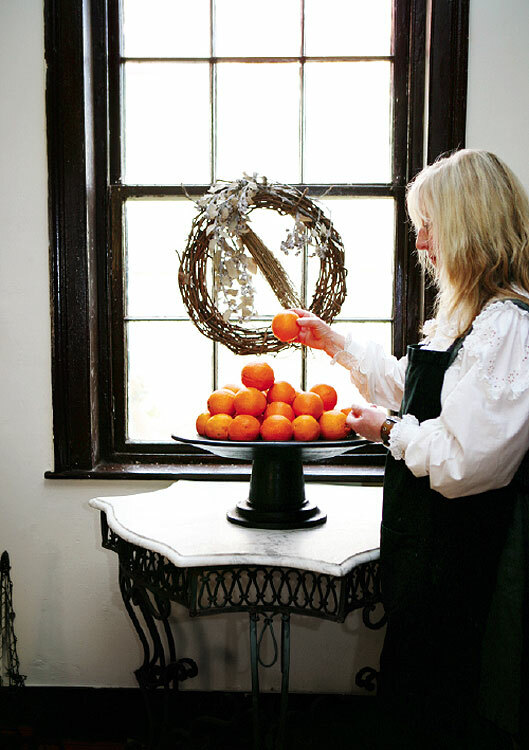 Once again, the emphasis (frequently mentioned by the owners) is on fresh ingredients. If you are taking the western route, the road past Hall reveals Poachers’ Pantry. This was first purchased as a tree change for its entrepreneurial owners Sue and Robert Bruce, who converted the restored farm cottage into a gourmet smokehouse, providing hot-smoked meat to Tetsuya’s and the business class menus of Qantas. There was space on the property, so the business expanded to include a busy café/restaurant and a winery, the Wily Trout Vineyard. Poachers’ Pantry (02) 6230 2487. 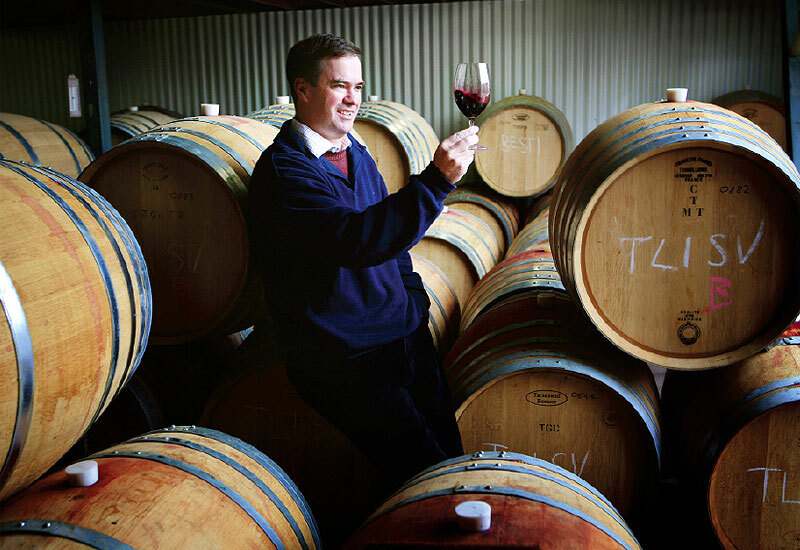 The Canberra region has only recently started to flourish as a winemaking centre, which is perhaps surprising. The mild summers and notoriously cool winters make it far more naturally suited to vineyards than the thriving Hunter Valley region. 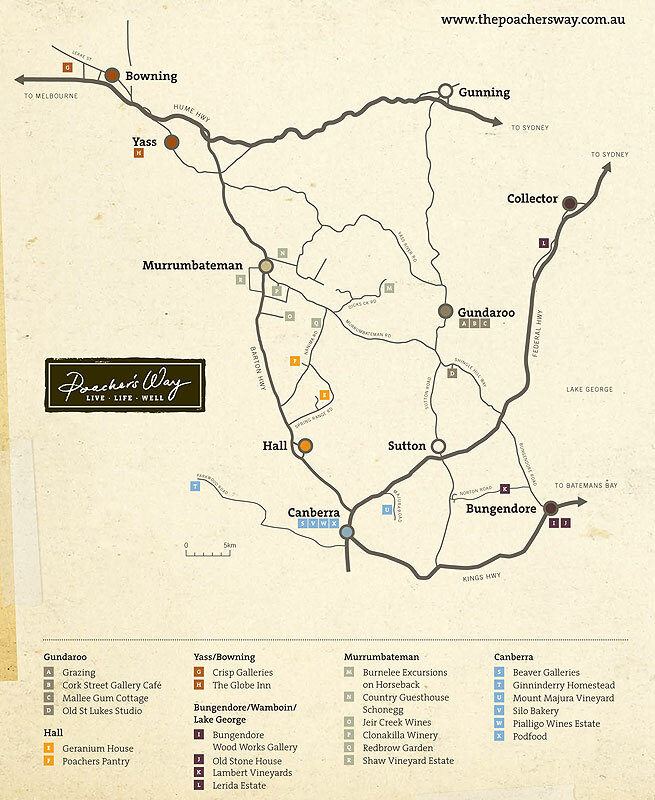 The region’s densest cluster of vineyards is around the town of Murrumbateman to the north, where one of the oldest and most prestigious wineries, Clonakilla, has been a favourite of connoisseurs since it was founded 1971 (especially its flagship Shiraz Viognier). Some of the newer kids on the block have already won multiple awards, but just to be on the safe side, they include gourmet restaurants next to their cellars. Shaw Vineyard Estate, opened a mere three years ago, looks like an Italian villa, complete with outdoor dining in its Cello Cuisine restaurant. Further afield in Wamboin, Lambert Vineyards’ scenic, 40-acre vineyard can be viewed over a gourmet meal at the frequently busy restaurant. 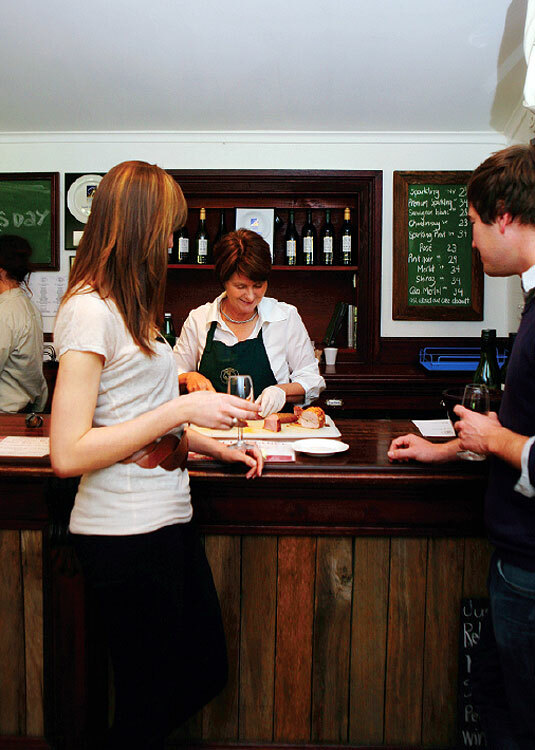 Clonakilla Winery (02) 6227 5877. Shaw Vineyard Estate (02) 6227 5827. Lambert Vineyards (02) 6238 3866. Most experiences along The Poacher’s Way equate more with relaxation than athleticism. 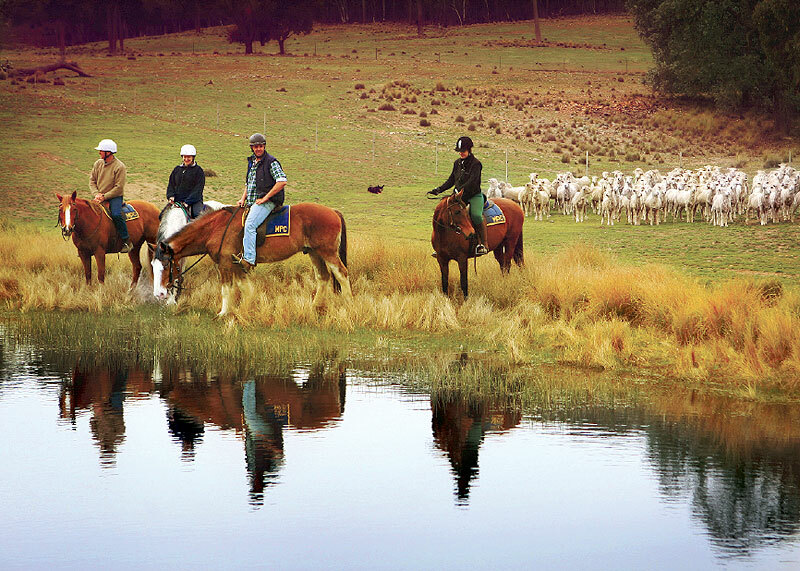 Hence, Burnelee Excursions on Horseback, exploring the trails near Murrumbateman, is a comparatively heroic activity. Also off the beaten track, but providing perhaps the most relaxed experience of them all, is Geranium House, a day spa at Hall that offers sustainability, even using recycled water and incorporating a tree-planting program. Burnelee Excursions on Horseback (02) 6227 5850. Geranium House (02) 6230 9220. The Poacher’s Way includes a few stylish guesthouses – The Globe Inn in Yass, Mallee Gum Cottage in Gundaroo – that nicely suit the other country-style businesses in the collective. 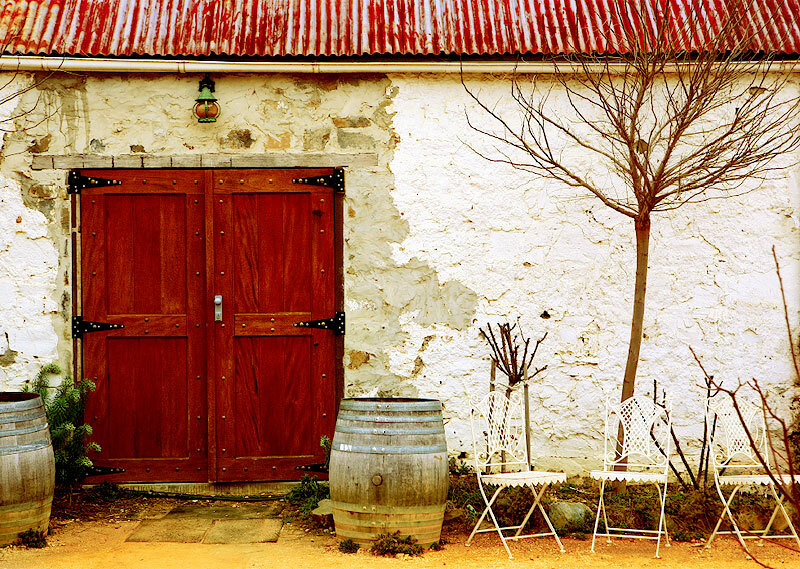 One of the newest members, The Old Stone House in Bungendore, is a perfect example. Two years ago, the current owners decided to double the established B&B place as an antique gallery. The furniture is authentic: Victorian-era beds, a 1910 upright piano, a 1920s Bakelite radio, two gramophones and a collection of 78s to play on them. The result is a cosy and popular B&B, a suitable place to stay after touring The Poacher’s Way. Ginninderry Homestead (02) 6254 6464. The Globe Inn (02) 6226 3680. Mallee Gum Cottage (02) 6236 8366. The Old Stone House (02) 6238 1888.